The urban way of life has been criticized for many centuries, as long as the cities have existed. A romantic tradition credits nature with the qualities opposite to the city: nature is declared an embodiment of purity, health and beauty. A more rational and economical view defines nature as a system capable of restoring living resources. The article shows how cities will be inevitably filled with elements of nature. Endlicher, W. et al. (2014). Urban ecology – definition and concepts. In: M. Langner & W. Endlicher (Eds. ), Shrinking Cities: Effects on Urban Ecology and Challenges for Urban Development (2nd, revised ed.). Frankfurt am Main, Berlin, Bern, Bruxelles, New York, Oxford, Wien: Peter Lang. Rousseau, Jean-Jacques. (1992). Discourse on the Origin of Inequality. Indianapolis, Indiana: Hackett Publishing Co.
Stolberg, F. V. (Ed.). (2000). City ecology: manual. Kiev: Libra. Thoreau, H. D. (1908). Walden, or, Life in the woods. London: J.M. Dent. Wright, F. L. (1932). The Disappearing City. NY: William Farquhar Payson. LIDIN, Konstantin. Nature in the City: Romance and Economy. 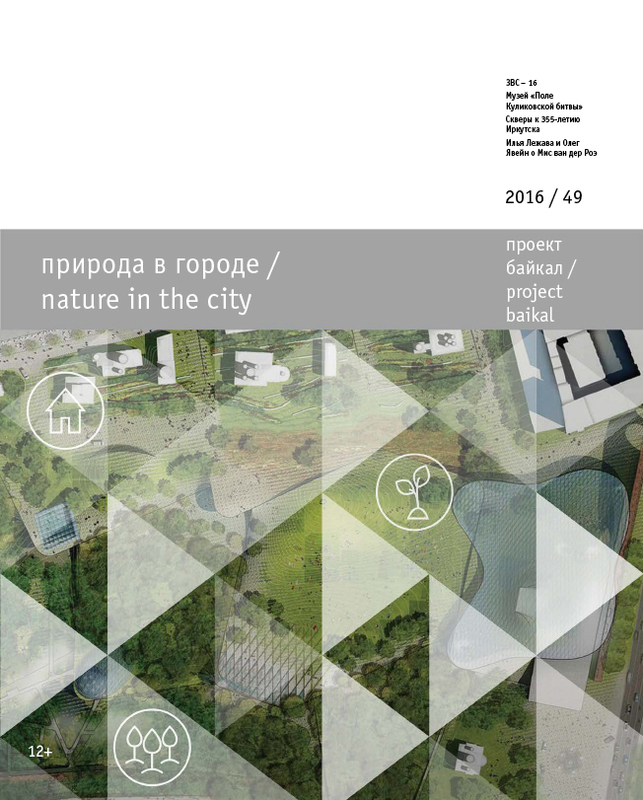 project baikal, Russian Federation, n. 49, p. 48-53, aug. 2016. ISSN 2309-3072. Available at: <http://projectbaikal.com/index.php/pb/article/view/1049>. Date accessed: 23 apr. 2019. doi: https://doi.org/10.7480/projectbaikal.49.1049.